In New Orleans, they created a website that gives residents up-to-date information on the status of vacant properties. In Philadelphia, they developed an app that lets citizens weigh in on government discussions via text message. And in Boston, they made mobile apps for parents to track the school bus in real time and for teachers to send students text reminders. 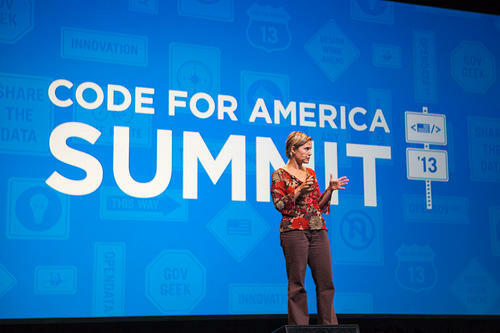 The city was one of 10 selected for a yearlong fellowship with Code for America, a nonprofit that pairs local governments with top technology minds to develop new tools for enhancing government services and community engagement. It’s “the Peace Corps for geeks,” said City Council member Greg Phipps of District 4 at the kickoff event Thursday afternoon at the uptown office of Skookum Digital Works, a 55-employee software development company. Susan Patterson, director of the Knight Foundation, which is helping to fund the Code for Charlotte program, likened it to the Teach for America model. Talented individuals from around the country – in this case, coders and Web designers – apply to enter the Code for America program, which is based in San Francisco. Cities then apply to get the fellows. If chosen, the organization assigns three or four fellows to a city for a year. The fellows spend weeks meeting city leaders, community groups and local business organizations, to find out “pain points” – areas that need better communication between government and citizens. 1/2 weeks residing in Plaza Midwood and exploring the city. Then there’s the Code for Charlotte “Brigade,” made up of about 150 feet-on-the-ground volunteers, who’ll work with the fellows to develop and implement their plans, while also working on a few of their own. The fellows will decide on their project next month. The Brigade discussed potential projects of their own at a volunteer meeting Thursday night. Jim Van Fleet – a Charlotte-based entrepreneur, software engineer and developer – is leading the local Brigade, with members ranging from suit-clad bankers to jeans-and-T-shirt startup designers, marketing professionals to community leaders. And you don’t have to know how to code to be involved. It usually costs about $360,000 to operate the program in a city for a year, which covers the fellows’ living expenses, transportation, technology and resources, said Luke Norris, Code for America’s director of government relations. Most of the time, the host city covers about 50 percent of the cost, Norris said. The rest comes from a mixture of grants and donations from companies and civic groups. As of Thursday, the city has invested nearly $50,000 and the Knight Foundation has invested $75,000, Norris said. But the fundraising is just getting started, Norris said. Code for America would like to raise enough to keep Charlotte’s program going for two years.